Nokia announced the Lumia 625 back in July, a couple of weeks after the company unveiled the 41MP Lumia 1020 cameraphone. This is also the last Lumia phone unveiled before Microsoft acquisition of Nokia Devices and Services. And while it's still unclear what will happen with the rumored Lumia 1520 phablet, the Lumia 625 has already gone on sale. The Lumia 625 has also made it to the IFA show, where we finally got to spend some quality time with the smartphone. It's quite an interesting gadget that offers big screen on a budget. The Nokia Lumia 625 is running on a Qualcomm Snapdragon S4 chipset with a 1.2GHz dual-core Krait processor, Adreno 305 graphics and 512MB of RAM. Microsoft and Nokia successfully proved the Windows Phone 8 is a miracle worker that runs hassle-free on this, now considered lower midrange, hardware. Unfortunately for the gamers, there are lots of titles incompatible with WP8-handsets with less than 1GB of RAM, so the Lumia 625 doesn't quite make for a killer gaming experience despite its large screen. Now that we get this out of our way, let's focus on the positive sides of the Lumia 625. First, Lumia 625 comes with a big 4.7" IPS display of WVGA resolution. This adds up to a rather low 200ppi, but in this class it works quite fine. And it's not like the screen looks pixelated or anything - sure it's not the sharpest we have seen but with the WP8 interface it certainly isn't irritating. Besides, the screen offers lively colors, good contrast and decent (if not quite perfect) viewing angles. It isn't a ClearBlack unit, which suggests it probably won't do all that great outside. From a design standpoint, the Nokia Lumia 625 is pretty much an oversized Lumia 520. It has the same lines, layout of controls and similar back cover finish. The front has the three mandatory Windows capacitive controls below the display and the earpiece plus the secondary VGA camera for video chat. The right side of the Lumia 625, just like the rest of the Lumia gang, houses the volume rocker, the Power/Lock key and the hardware camera shutter - all three of them made of plastic. The 3.5mm audio jack is on the top of the Lumia 625, while the microUSB port is at the phone's bottom. The back is made entirely of polycarbonate. The curved shape and soft rubbery finish make for a handset that's got plenty of grip and style. The 5MP camera lens accompanied by a LED flash is at the Lumia 625's back. The loudspeaker grille is also around. The Nokia Lumia 625 is available in Orange, Bright green, Yellow, Black and White. We saw the orange and yellow units and they both look quite fresh with a distinct youthful appeal. 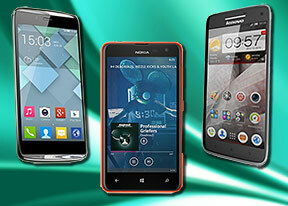 The large 4.7-inch display is not the only thing that sets the Lumia 625 apart from other midrange Lumia smartphones. The Lumia 625 also supports LTE connectivity, comes with a faster 1.2GHz dual-core processor compared to its 1GHz 520/620/720 siblings and offers 1080p video recording at 30 fps. Nokia Lumia 625 seems like a pretty decent deal, seeing it costs only about €230. We will be able to tell for sure once we get a review unit and put it through its paces.